The coast of the Red Sea stretches for over thousand kilometres from Suez to Halaib,a little town situated near the Egypt - Sudan border. A natural internal border to the west is formed by a mountain chain sometimes known as the Arabic chain. These mountains, which contain some peaks of over 2000 metres,were formed by the movement of intercontinental plates over 40 million years ago. There is a succession of beachs, bays and coral formations which become increasingly impressive as you go southwards. On the other side of the mountains is the rocky Arabic desert, which flows into the Nile valley. It is lined by eyecatching wadis, beds of rivers dried up long ago. 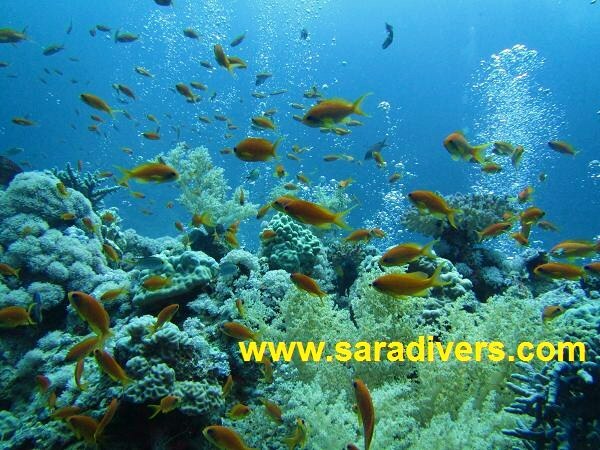 The Red Sea region, whose capital is Hurghada, is a veritable paradise for sea divers and sea lovers in general on account of the wide variety of marine fauna, the beauty of the sea-beds and the warm climate. You can enjoy diving all the year. You may dive with shorty suits in summer and 5mm wet suits in winter. It's often windy in winter, so that you'd better have your jacket for after the diving. * Dive safely and enjoy. If you worry about your diving skill, don't hesitate to tell your diving guide. * Don't touch the bottom. * Don't collect any creatures or things from the Red Sea.